The development of Dempsey Dyer over 40 years means that we have a lot of experience in the industry – this is vital for us to be able to offer an efficient service. Equally, our experience means that we know the industry inside out, and can work more effectively with all of our customers, whether they are based in the commercial or trade sectors. The first few years were spent developing timber products for trade customers. The 1980’s saw the introduction of uPVC production to Dempsey Dyer Ltd. Our trade customer base began to increase with orders from across the country. This period saw business increase as Dempsey Dyer became well known in the Fenestration Industry for the quality of our products. Our commercial customer base expanded providing Dempsey Dyer with a solid understanding of commercial customer requirements. From 2005 a large investment was placed into upgrading the uPVC area of Dempsey Dyer featuring new machines linked together with industry software to streamline our quoting, ordering, production and loading processes. As from 2009, similar investment will be seen in the timber production area of Dempsey Dyer. Arguably the most exciting period in the company’s history, 2011 onwards has so far seen the introduction of a new patent-pending product; “The Beaumont” together with the launch of several new products in both timber and uPVC. In the second quarter of 2012 a contract was signed with two well established software firms to provide one common platform for the company to help streamline efficiencies. Can't find what you're looking for or would like a trade quote? Get in touch with us. Find out more by visiting our dedicated homeowner website. Stay up-to-date with Dempsey Dyer and get the latest in the fenestration & glazing industry. 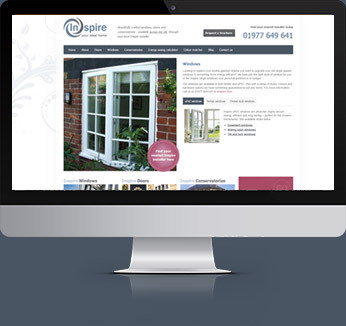 Inspire your customers with the Inspire range from Dempsey Dyer with a dedicated retail website. If you want to know more about our products, processes and accreditations, fortunately we offer a range of downloads. Download a range of literature free of charge, to refer to in your own time. Installers and other businesses can only work effectively if they have a reliable trade supply service – offering the highest performing products. Luckily, here at Dempsey Dyer we only supply the latest options from market leaders. This guarantees quality, performance and durability – regardless of the product choice. You don’t just have to take our word for it. A range of familiar third parties have accredited our work. This gives you peace of mind that our practices and products consistently meet high standards and requirements. Contact us at our head office, open 8:00am - 5:00pm Mon-Thurs & 8:00am - 4:00pm Friday.